I have been busy every spare minute getting the veggie garden organised. 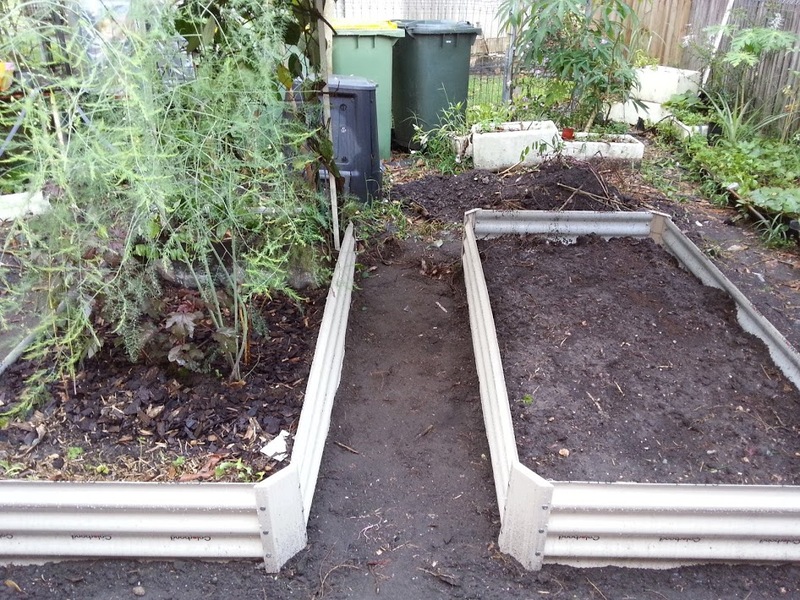 A couple of weekends ago we were looking at the swale/hugulkuture area, and thinking that the front part with the raised beds looked so nice and neat and didn't want to have the back area looking untidy. Here you can see the small hand dug swale area and raised area mostly consisting of roots and branches behind the two raised beds. 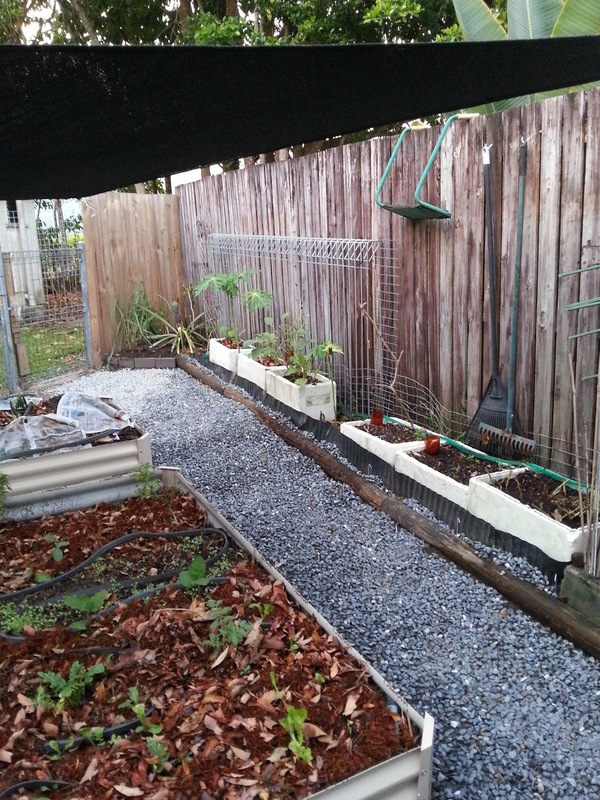 I have only ever read about swales in large areas, and the same with hugulkulture, so would it be possible to combine the two into a raised bed system, and have another raised bed behind the two - essentially having the hugelkuture contained in a raised bed? Our nearest Bunnings had run out of the same type of raised beds, so we ordered one in, and last Sunday went down to pick it up. I had hubby assemble it, while I dug out around the mound I had created - the hugelkuture mound - I love saying that word :) I popped it right over the top, added the gravel and suddenly the garden looks so much more organised. I placed the polystyrene boxes against the side fence, with some wooden logs in front to divide them off from the stone pathway, which is now nice and wide. I would love to plant some flowering plants there, to hang over the front of the boxes. Thanks Mr Homemaker for the suggestion! 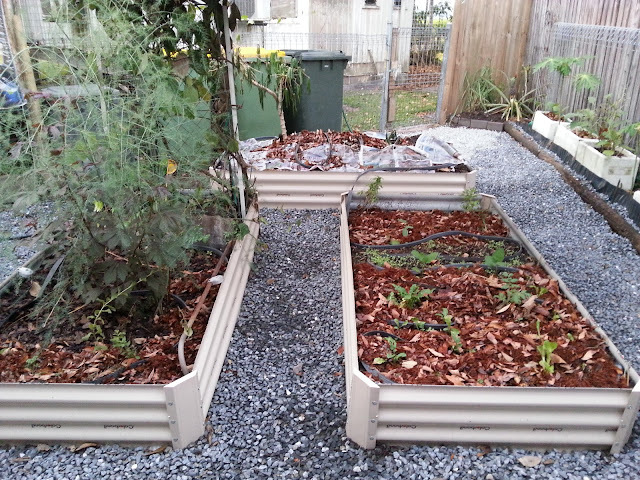 I am also on the lookout for more of the higher boxes, as they are better for wicking beds. I know I do go on about wicking beds, but just look at these two boxes with eggplant. Both from the same six pack and planted at the same time! Watered the same amount. 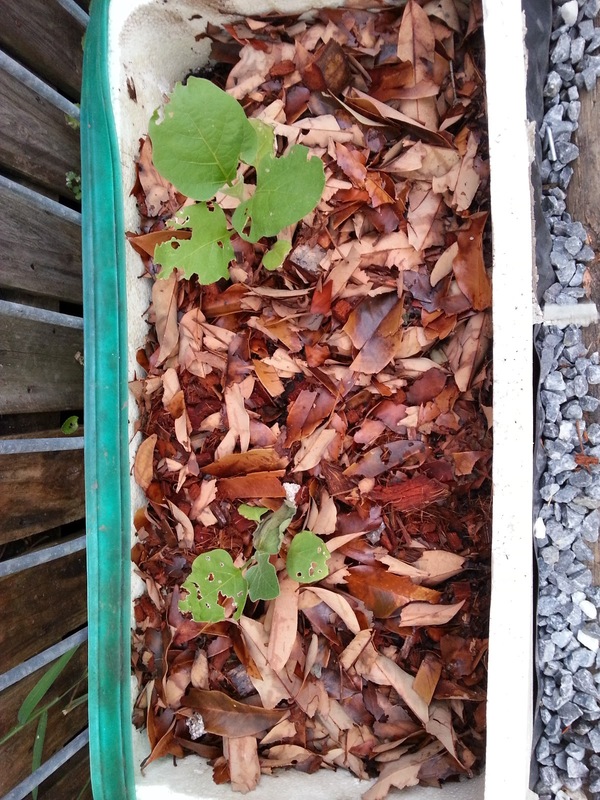 I planted a few lettuce seedlings, wild rocket, tomatoes, and some ginger into the forward bed. 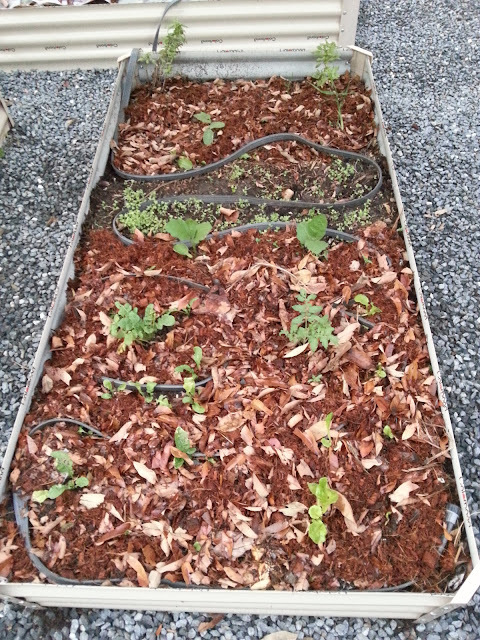 I spread some mulch out over the top of this bed and newspaper on the hugelkulture bed over the weekend. I normally use sugar cane mulch, but the price has suddenly jumped up, so I bought a package of coir which I mixed with mulched leaves. 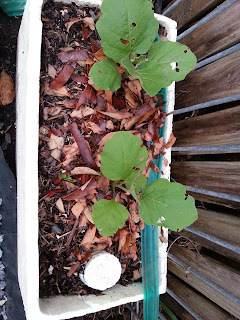 I really want to try to not buy too much to add into the garden, so am going to be looking for other ways to provide/grow my own mulch. 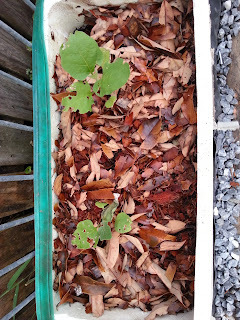 We do have lots of leaves we can mulch down and mix with compost, or chicken manure, which I think is going to be my preferred mulch from now on. 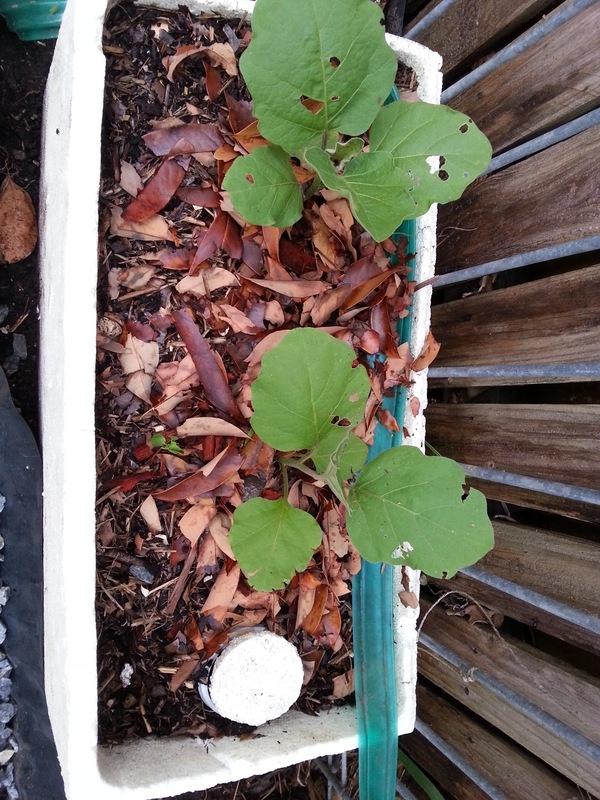 The leaves on their own tend to blow around and might be robbing nitrogen from the soil. I think if I add something like the manure or compost then it tends to not get the nitrogen from the soil itself. Do you do anything to stretch your mulch? I also practice chop and drop which creates a mulch and leave a lot of the leaves where they fall in the flower beds. We are heading into the wet season, which is not our main growing season, so hopefully this soil can just sit and mature and sweeten up, ready to be planted out in April. I am interested to see how much the soil in the hugulkulture bed will reduce as it all breaks down. I love to try new things, and I especially like the fact that we as bloggers can share the knowledge that we gained from each other. Thank you for reading my blog and commenting! I have been wondering how our northern friends have been coping with the heat of late. Isn't it unbelievably hot up there? I know Chris from Gully Grove is hugely interested in swales and hugelkulture but she does have a larger area to experiment with. I hope you have success with your garden beds and hopefully the wet season is just around the corner and the temps can get back to normal. I did hear mention on the news of a possible cyclone on the horizon. Oh yes Nana Chel, we have had record breaking heat. Luckily in the last two days we have had quite a bit of rain, which is lovely. We are on level 3 water restrictions, which is unheard of in the tropics! The cyclone evaporated, supposedly because the water temperature was not quite hot enough to sustain it - sizzle sizzle! I have never heard of hugeculture so had to look it up. Don't expect to get any garden wisdom from me. I am hopeless with my garden. Oh I think you are too hard on yourself. There is always something new to learn I think! I am really pleased with how it has turned out. I just need a good lot of tropical rain though to try it all out!